Lucy Maynard Salmon was born on July 27, 1853 in Fulton, NY to George and Maria Clara Maynard Salmon. Her father was a prosperous tannery owner and her mother had been the first principal of Fulton Female Seminary. Salmon attended the Seminary’s coeducational successor, Falley Seminary. In 1872 she entered the University of Michigan, a year after it had begun to admit women. After receiving her A.B. in history in 1876, Salmon served as assistant principal and later principal of McGregor High School in Iowa. In 1882 she returned to Ann Arbor where she wrote her master’s thesis, "A History of the Appointing Power of the President," which was published in the first volume of the American Historical Associations’ Papers in 1886. After receiving her M.A. from the School of Political Science in 1883, Salmon taught history in Indiana State Normal School in Terre Haute. In 1886 she attended Bryn Mawr on a history fellowship where she studied under future United States president Woodrow Wilson. In 1887 Vassar College hired Salmon to establish its history department and serve as Associate Professor of History. At the end of her second year she received a full professorship. Salmon rejected the traditional method of teaching history that emphasized memorizing and recalling facts about prominent figures and noted events. As a member of the "new social history" school, she believed that such methods overemphasized political histories, while dismissing other important aspects of the past, and that it discouraged students from questioning scholarly authorities. Instead, Salmon encouraged scholarly independence by training her students to compare and criticize several interpretations before formulating their own conclusion and to consult primary source material in addition to secondary scholarship. Her courses were designed less to convey historical facts than to train students in the process of historical investigations. She taught her students how to discriminate, judge and analyze sources and to produce independent work. She believed that "if a child is sent to school to learn he may never learn how to learn." Salmon’s courses also emphasized the continuity and unity of history insisting that "In weighing the merits of different fields of history as a subject of study the element of time in and of itself is the least important." Salmon’s interest in social history prompted her to embrace less traditional historical records. In addition to scholarly documents, Salmon’s students analyzed kitchen appliances, architecture, and even the Vassar College catalogue for their historical and social significance. Such records are of particular interest to the social historian because of what they reveal about ordinary life. One of Salmon’s favorite historical records was the laundry list. Salmon and her class in Historical Material advertised in the Vassar Miscellany before winter break for students’ laundry lists from home. "Laundry lists," the ad read, "being closely and continuously connected with daily life, reflect custom and change in social conditions, industry, or in language, with a detail and rapidity which other sources seldom do." In one of Salmon’s most famous essays, "History in a Back Yard," she studies her own property as a historical record: The neighbor’s fence signifies "Prehistoric questions of the ownership of land", the grapevine recalls the German Revolution of 1848, the flower bulbs suggest Greek mythology, and "the discovery of a new world rises in our Norway maple." Students would later recall Salmon’s "gift of finding in the common place something significant." Unfortunately, Salmon found the Vassar library pitifully inadequate for her teaching methods. When Vassar President James Monroe Taylor answered her pleas for more books for the history department by insisting that the school "has absolutely no fund to draw upon" and that the few books that the library did possess were sufficient, in February 1896 at a reunion of former history students, Salmon founded the Vassar Alumnae Historical Association. Its purpose was threefold: (1) To facilitate cooperation between the Alumnae and Vassar College; (2) To stimulate interest in historical work; (3) To secure books on history for the Vassar College Library. The society dedicated most of its resources to the latter purpose, devoting all funds in the treasury to purchasing books. The society met regularly until 1913 when its meeting date conflicted with another campus event that President Taylor refused to change. Salmon and Taylor had another disagreement in 1906 when, without her knowledge, the Committee on Faculty and Studies recommended dividing the History Department, giving Professor James Baldwin, whose teaching methods were more traditional, charge of the European History Department and Salmon charge of the American History Department. Not only did the proposition violate Salmon’s belief in the unity of historical development, but it virtually displaced her as head of the History Department since Baldwin would have charge of thirteen courses and she only three. The committee justified its decision by stating that they wanted to "promote unity" in the department, and "to emphasize the fact side of history, rather than that of method work," which Salmon preferred. In a passionate letter to Taylor, Salmon fought for her position, justifying her teaching methods as characteristic of the "modern development of historical study" and insisting that "to arbitrarily divide a department is not to unify it at all, but to destroy it." Finally, Salmon refused to remain as head of either department if the committee’s recommendation was executed. The History Department remained united and Salmon retained her position. Lucy Maynard Salmon with class. Salmon’s influence extended well beyond Vassar, and she was one of the first and most influential women leaders in the historical field. In 1885 the American Historical Association admitted her, and in 1897 the Executive Committee invited Salmon to serve on the Association’s Committee of Seven, responsible for recommending the nation’s secondary school history curriculum and college entrance exams. In 1915 the Association’s members elected her to their Executive Council. In 1901 Salmon founded and presided over the Historical Association of the Middle States and Maryland, later called the Association of History Teachers of the United States and Maryland, the purpose of which was "to advance the study and teaching of history and government through discussion and publication" and to "promote personal acquaintance among teachers and students of history." Salmon also served on the National College Equal Suffrage League and on the Executive Advisory Council of the Congressional Union for Woman Suffrage. 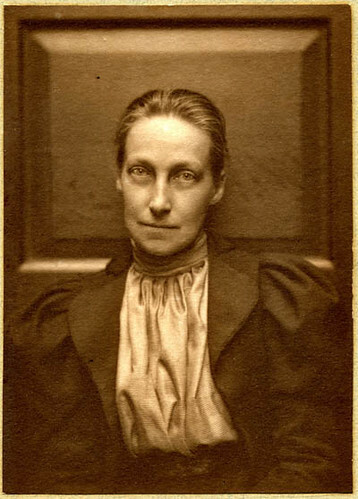 She led the suffrage movement at Vassar, despite the disapproval of the Trustees and of President Taylor, who believed that the school’s mission should be education, not social reform. When the President prohibited Vassar suffragists from holding a meeting on campus, they took it to the adjacent graveyard. Although Salmon conceded to Taylor’s request that she not attend the meeting, she gave the students her full support. 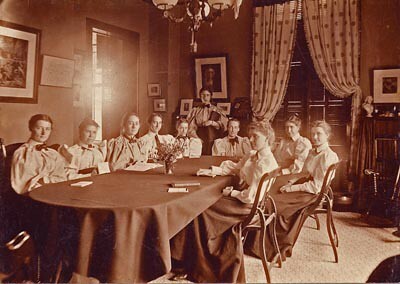 Not until 1914, after Taylor had resigned, did the faculty grant students permission to form an on-campus suffrage club. The opportunity for Salmon to cultivate her democratic ideals occurred in 1914 when President Taylor resigned. While the trustees searched for a replacement, Salmon organized the faculty to secure greater decision-making power and sent the trustees a guideline for selecting the next president. Salmon used her enhanced influence to institute a plan whereby faculty members would welcome freshman to the college during a formal convocation and the week prior to the beginning of classes would be dedicated to introducing freshman to their new environment, practices that continue at Vassar and most other colleges today. Taylor's successor, Henry Noble MacCracken], proved a far more progressive and accommodating president. He and Salmon worked together to democratize and reorganize college government, and in 1923 proposed The Vassar College Statute of Instruction which became a model for college constitutions. Salmon was also an active and influential Poughkeepsie citizen. Every year she attempted to purchase a ticket for the public dinner of the Chamber of Commerce and every year they denied her because she was a woman. She served as regent of the Poughkeepsie chapter of the Daughters of the American Republic, opening the first Poughkeepsie playground in 1909. Her success finally prompted the Chamber of Commerce to appoint her to a committee to "Clean up Poughkeepsie". Salmon was a prolific writer, producing over a dozen books and over a hundred essays and lectures. Her Domestic Service, based on a series of questionnaires she created and distributed to domestic servants and their employers, was the first scholarly study of the subject. It examined its historical, industrial, and social aspects and included suggestions for remedying its problems. Most critics acclaimed the book as a fresh and vital contribution to the field, although some criticized it as unoriginal and unworthy of a historian. (1) In 1923 Salmon published The Newspaper and the Historian and its companion The Newspaper and Authority. The former examined how the press can inform historians’ study of the past, and The Newspaper and Authority discussed how censorship restricted the press’ serviceableness for the historian. Salmon’s last completed work, Why Is History Rewritten?, published posthumously in 1929, illustrated the necessity of revising historical interpretations based on previously overlooked or dismissed records in order to attain a more complete historical truth. Salmon’s academic accomplishments and contributions did not go unrecognized. In 1912 she received an honorary Doctor of Human Letters from Colgate University, and in the summer of 1926 she received an honorary Doctor of Letters from the University of Michigan. In February 1926, exactly 30 years after her founding of the Vassar Alumnae Historical Association, a group of alumnae and friends of Salmon established the Lucy Maynard Salmon Fund, which enabled her to continue her research until her death on February 14, 1927. The Fund continues to endow Vassar faculty research. For criticism of the book see Box 49, Folder 8-8A, Vassar Colllege Special Collections. Chara Haussler Bohan, Go To the Sources: The Life of Lucy Maynard Salmon, (New York: Peter Lang, 2004) 2, 34. Louise Fargo Brown, Apostle of Democracy: The Life of Lucy Maynard Salmon, (New York: Harper and Bros, 1943.) 133, 210-11. Elizabeth A. Daniels, Bridges to the World: Henry Noble MacCracken and Vassar College, (New York: College Avenue Press, 1994). Lucy Maynard Salmon, “The Teaching of History in Academies and Colleges,” in Woman and Higher Education, (New York: Harper and Brothers Publishers, 1893). Lucy M. Salmon, The Newspaper and Historian (New York, Oxford University Press, 1923). Lucy. M. Salmon, The Newspaper and Authority (New York, Oxford University Press, 1923). Lucy M. Salmon, Why Is History Rewritten? (New York, Oxford University Press, 1929). Lucy M. Salmon, Domestic Service (New York, MacMillan, 1987). Helen Hadley papers, Box 1, Folder 13, Vassar College Special Collections (VCSC). Lucy Maynard Salmon (LMS) Biographical file #1, VCSC. LMS Biographical File #2, VCSC. LMS Biographical File #5, VCSC. LMS papers Box 45, Folder 6 in VCSC. LMS Papers, Box 48, Folder 2, VCSC. LMS Papers, Box 48, Folder 6, VCSC. LMS to Henry Noble MacCracken, LMS papers Box 3, Folder 3 VCSC. Henry Noble MacCracken to LMS, LMS papers Box 7, Folders 7 and 11, VCSC. James Monroe Taylor to LMS, Box 8, Folder 7, LMS papers, VCSC. James Monroe Taylor, “The ‘Conservatism’ of Vassar,” James Monroe Taylor papers Box 5, Folder 23, VCSC. Woman Suffrage papers Box 5, Folder 23, VCSC. Rebecca Lawrence Lowrie, “Lucy Maynard Salmon,” LMS Biographical file #1, VCSC. Lucy Maynard Salmon: “What Is Modern History,” Poughkeepsie, NY, 1917, VCSC. “The Evolution of the Teacher,” LMS papers Box 58, Folder 31, VCSC. “Analysis of Laundry Lists,” Box 54, Folder 1, VCSC. “History in a Back Yard,” Poughkeeepise, NY, 1915, VCSC. “College Government,” The Vassar Miscellany 24 (January 1895): 149-60. “The Next College President,” The Popular Science Monthly (September 1913). “Monarchy and Democracy in Education,” Unpopular Review 2(1912).